When I tell my colleagues that some of my fieldwork takes place in the Bahamas, I usually get the following response: "Do you call that work? Let me know when I need to pack my swimsuit to join you." I have to say, I enjoy working here, most of the time. 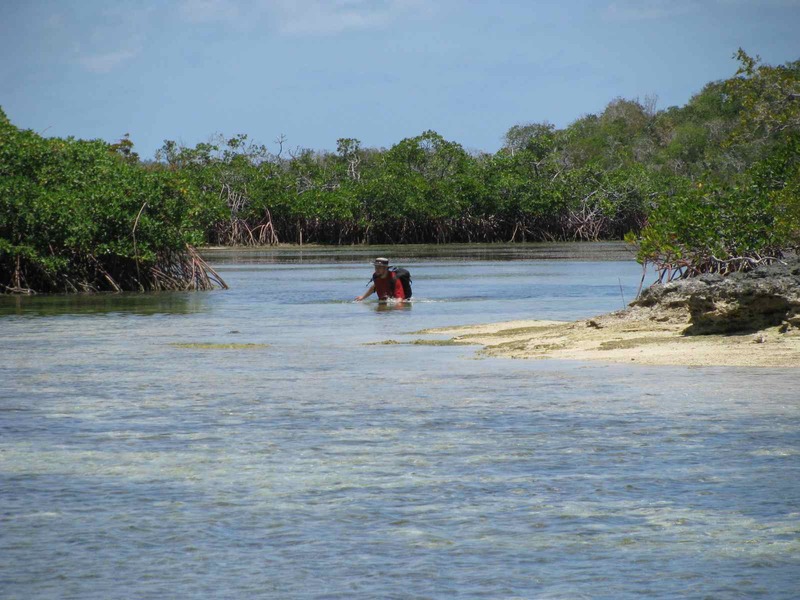 The area is packed with marine wildlife, and there is a decent amount of bird and plant diversity. The sunrises and sunsets are stunning and the water is crystal clear, which brings me back to my colleagues and their generous offer to help. 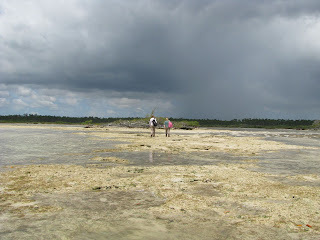 There are a few wrinkles of our field site that can be disappointing to those interested in enjoying the beach. First, there are no beaches where we work. 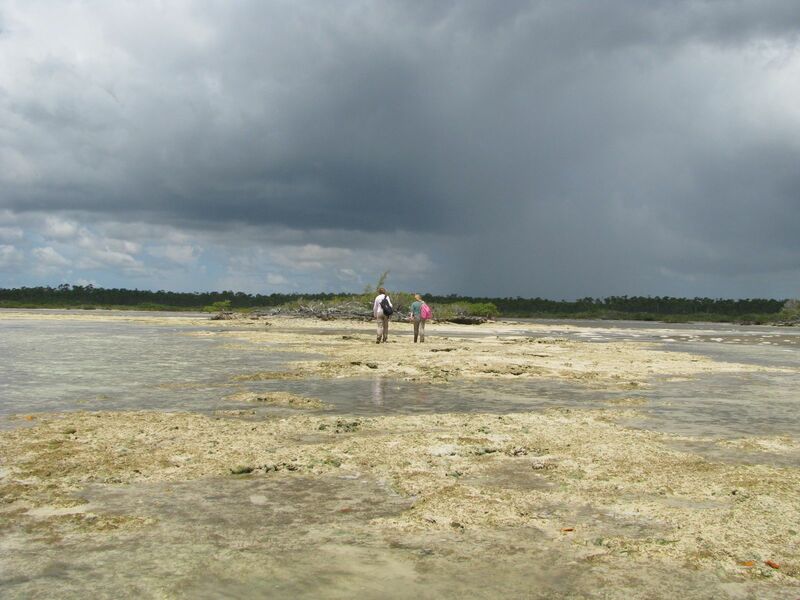 Our study site consists of a series of small islands, or more accurately, rocks formed out of limestone. Through time these rocks have been pounded by waves resulting in a uneven surface with many sharp, jagged points that make walking on them less than comfortable. Oh, and I nearly forgot, these rocks get extremely hot (up to 120 °F according to our temperature data loggers!). This heat might explain why most of our tennis shoes only last one season of fieldwork -- the soles literally melt. Also, the heat and humidity can lead to very impressive storms. However, no storms are big enough for Angie and Maria, who are happily walking toward one. Second, we spend a nice amount of time walking with a decent amount of equipment, including backpacks and heavy Pelican cases, across (or in) a somewhat muddy sea-floor, which is riddled with jellyfish. Needless to say, you can even feel the stings through your clothes -- one of the instances where a swimsuit is not a particularly good idea. In case you are wondering: yes, we have boat. However, at low tide it is impossible to use a boat, and if you are in the field for 12 hours, you might get lucky and experience low tide twice on the same day. Below is Dustin triumphantly walking out of one of our cays and into the middle of the channel. Finally, coming back to those gorgeous sunrises and sunsets, it turns out that they are also the peak-time for sand-flies, which means every morning when we are trying to get the boat ready, we are also fighting a dense cloud of sand-flies. Another reason why you want to wear long pants and long-sleeve shirts. In a nutshell, working here can be a little harder than a typical day at the beach. As illustrated by Dave's face as he approaches the boat. However, each day brings a NEW ADVENTURE and we are glad to be here. Please come and join us, but you might want to pack working clothes instead of your bathing suits.